MusicCast-enabled products from Yamaha allow professional integrators to assemble whole-house A/V systems that include zones of surround sound. 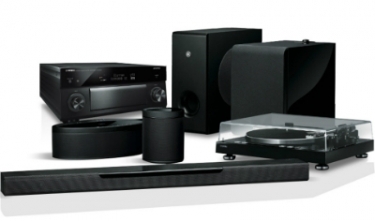 Wireless audio is as common as broadcast television in today’s world of home entertainment, but that doesn’t mean all wireless audio products are built the same. Solutions like the MusicCast platform from Yamaha have risen above the fray, enabling integrators to deliver a high-performing, reliable user experience that doesn’t sacrifice functionality for flexibility. MusicCast is a wireless system that can be used to distribute audio throughout a home, and tie together multiple A/V components within the same home to bind surround sound systems and whole-house audio zones together in home spaces. Spearheading the latest generation of MusicCast products for integrators is the XDA-QS5400RK quad streamer, or “QS” for short - a four-zone streaming amplifier at 1U tall. With eight channels of audiophile-grade Class D amplification and a host of other CI-friendly features, it can serve as the backbone of any A/V system. Showing how easy it is to blend whole-house audio and home theater components under a single roof with the new MusicCast-enabled quad streamer is Nashville, Tenn.-based Litton AV. Kevin Litton, owner of Litton AV, says he uses a variety of products to address a range of audio applications. Yamaha MusicCast products, Litton says, help to separate his company from the retail market and other familiar brands in the retail landscape. For example, some of the features that make the quad streamer unique in the whole-house audio market category are its includes doorbell chimes and paging options that the system can transmit to four zones throughout a home. “I can setup MusicCast quickly, and perform installations efficiently with it,” Litton comments. Citing an example of a recent installation, Litton recalls that he installed an AVENTAGE RX-A1080 receiver into a client’s home and a zone of music in the adjacent kitchen. Litton says the customer likes his two-zone system configuration because it enables people in the kitchen to hear what’s going on in the surround zone without having to play the surround system at high volume levels. The system also allows the home to share home theater sources such as Apple TVs and cable/satellite set-top boxes (STBs) without having to invest large amounts of system setup labor. Facilitating the ability to share these types of sources, the A1080 includes a built-in digital-to-analog converter (DAC) to decode HDMI audio and send it to the second analog zone without additional converters. One of the newest MusicCast products available to integrators is the XDA-QS5400RK, a four-zone, eight-channel quad streaming solution. The quad streamer is specifically designed for custom integrators and whole-house audio environments, and available exclusively to integrators. Taking up just 1U of rack space, the XDA-QS5400RK is expandable to deliver audio to as many as 32 zones via its built-in Class D amplifiers, daisy-chain capabilities and options such as Apple AirPlay, Spotify and Pandora. The XDA-QS5400RK also offers SiriusXM Internet Radio, SiriusXM for Business, TIDAL, Deezer, Napster, Internet radio and other services. Integrators can integrate the product into third-party control systems, and it’s controllable via a companion app. “I appreciate a company with dealer support lines. When I call into Yamaha I can get help and I get an even faster response time than consumers." Additionally, the quad streamer also plays networked music, and can connect to a network using a simple Ethernet connection. Litton notes that he installed two of the XDA-QS5400RK quad-streaming units to handle a client’s whole-house audio needs. In addition to supporting external sources through linking with MusicCast receivers and sound bars, another key selling point that solved the client’s need was the inclusion of a Cut-In input that automatically senses an input signal and temporarily overrides the selected source. “The client wanted an integrated doorbell and gate chime. The quad-streamer provided that capability without needing to introduce a separate control system,” says Litton. Litton also added the MusicCast BAR 400 sound bar within the same networked environment. The wireless MusicCast BAR 400 enabled Litton to add a home theater zone that he could tie into the quad streamer’s whole-house audio capabilities to create a seamless zone solution without pulling wires. This particular sound bar incorporates a companion wireless subwoofer, and it offers compatibility with UltraHD 4K video, HDR (high dynamic range) video content, Amazon Alexa voice control, and a choice of Dolby and DTS surround sound formats. A key option the MusicCast BAR 400 offers beyond its ability to integrate into a multizone MusicCast system is its wireless surround sound configuration option. Through this feature, integrators can set up a 5.1 wireless audio zone to playback surround sound broadcast, streaming video and home theater content without running wires throughout a room. Moreover, the soundbar also includes Apple AirPlay, Bluetooth and Spotify Connect capabilities to further enhance its whole-house audio functions. Looking back at what his client needed, Litton says the combination of the MusicCast BAR 400 and XDA-QS5400RK quad streamer met the homeowner’s needs within the budget the client specified. “It’s ideal to do something wireless, and I try to do as much as I can with wires, but there are cases where running wires isn’t possible,” he states. Litton adds that beyond the integrator-specific products that Yamaha offers, another element that he likes about the Yamaha product line is the level of support he receives. “It helps that Yamaha has dealer-only products as opposed to just retail products. It makes it difficult because customers will buy products and say ‘install this for me.’ You want to sell the product as well,” adds Litton.